Home / The Real Book Vol II 2nd Ed. 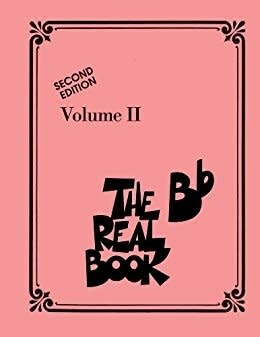 Hal Leonard The Real Book Vol II 2nd Ed. The Real Books are the best-selling jazz books of all time. Since the 1970s, musicians have trusted these volumes to get them through every gig, night after night. The problem is that the books were illegally produced and distributed without any copyrights or royalties paid to the master composers who created these musical canons. Hal Leonard is very proud to present the first legitimate and legal editions of these books ever produced. You won't even notice the difference...the covers look the same, the engravings look the same, the songlist is nearly identical, and the price remains fair even on a musician's salary! But every conscientious musician will appreciate that these books are now produced legally and ethically, benefitting the songwriters that we owe for some of the greatest music ever written! 400 songs, including: Air Mail Special * Birdland * Bye Bye Blackbird * Caravan * Doxy * Fly Me to the Moon (In Other Words) * Georgia * Girl Talk * In Walked Bud * I Remember You * I Thought About You * The Jody Grind * Just the Way You Are * Killer Joe * Little Sunflower * Mercy, Mercy, Mercy * Moanin' * The Nearness of You * Now's the Time * Old Devil Moon * Phase Dance * St. Thomas * Speak Low * Stardust * Tangerine * Tenor Madness * Watch What Happens * Whisper Not * Willow Weep for Me * Yardbird Suite * and more.